William Guenon was born on April 1, 1940, in Pennsylvania. He entered Officer Training School with the U.S. Air Force on November 9, 1962, and was commissioned a 2d Lt at Lackland AFB, Texas, on February 5, 1963. Lt Guenon completed Undergraduate Pilot Training and was awarded his pilot wings at Craig AFB, Alabama, in June 1964, and he then served as a C-130 Hercules and MC-130E Combat Talon I pilot with the 779th Troop Carrier Squadron at Pope AFB, North Carolina, from July 1964 to September 1966. His next assignment was as an MC-130E pilot with Detachment 1 of the 314th Tactical Airlift Wing at Nha Trang AB, South Vietnam, from September 1966 to March 1968, followed by service as an MC-130E pilot and flight examiner with the 7th Special Operations Squadron and the 322nd Tactical Airlift Wing at Ramstein AB and Rhein-Main AB, West Germany, from April 1968 to January 1975. During this time, Capt Guenon served as the Pilot of the MC-130E "Cherry One" during the Son Tay Raid, a clandestine mission to rescue American Prisoners of War 21 miles West of Hanoi, North Vietnam, on November 21, 1970. 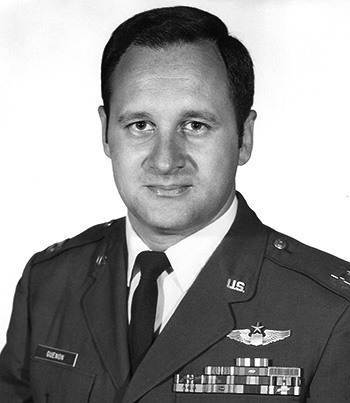 Maj Guenon then cross-trained as an Air Traffic Control Officer, serving as Chief of Air Traffic Control Operations with the 2069th Communications Squadron at Nellis AFB, Nevada, from June 1976 to June 1978. His next assignment was as Director of Air Traffic Control Operations and Chief of the Air Traffic Control Analysis Division with Air Traffic Services, Southern Communications Area, at Oklahoma City AFS, Oklahoma, from August 1978 to April 1981, followed by service at Ramstein AB, and Kapaun Barracks, West Germany, with the European Communications Division as U.S. Air Force ATC Analysis Team Chief for bases in Europe and Southwest Asia through May 1984. He then returned to McGuire AFB, New Jersey, where he retired from the Air Force on June 1, 1984. He completed service as an Air Force Command Pilot, Senior Air Traffic Controller, and air commando pilot. 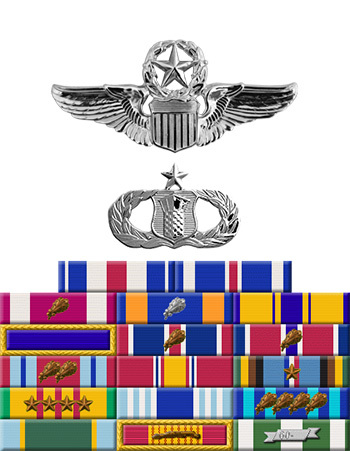 Captain William A. Guenon, Jr., distinguished himself by gallantry in connection with military operations against an opposing armed force during the Prisoner of War Search and Rescue Operation at Son Tay, North Vietnam, on 21 November 1970. On that date, Captain Guenon performed as Pilot on the lead aircraft of a force penetrating deep into enemy territory to rescue United States Prisoners of War interned at Son Tay. Completely aware of the enemy antiaircraft and surface-to-air missile threats enroute and in the objective area, Captain Guenon totally disregarded his personal safety and skillfully and accurately performed his pilot duties, thereby enabling the crew to lead the force precisely to the target. As a result of Captain Guenon's heroic efforts, the force arrived at Son Tay as planned, the enemy forces were completely surprised, and the mission was successfully completed. By his gallantry and devotion to duty, Captain Guenon has reflected great credit upon himself and the United States Air Force.